Today we thought we would address a common question we get from our clients, “How do I stuff my wedding invitations?” Wedding invitations can include the invitation, response card and envelope, maps, reception cards, accommodation cards and sometimes detail cards regarding a welcome party, after party or farewell brunch. 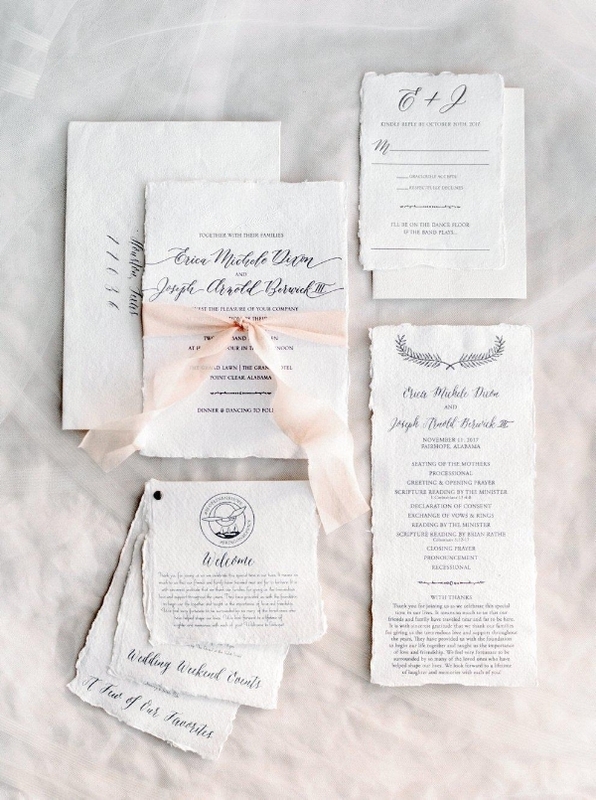 With all these pieces, I can see why someone who is stuffing invitations for the first time may be a little confused, but don’t worry, it’s easier than it looks. Step 1: Lay your invitation down words facing up. *if you decide to use tissue, place the tissue on top of the invitation. Traditionally tissue was used to keep the inks from bleeding onto the other items, but these days people tend to forgo the tissue due to the upgrade in inks and other types of printing. Step 2: Place the reception card onto of the invitation (or tissue) face up. Step 3: If you do not have any additional inserts skip to step 4. If you do have additional enclosures such as a map or accommodation card stack those wording up on top of the reception card. The particular order of these items does not matter, just layer them largest on the bottom and smallest on the top. Step 4: Lay the response envelope with the flap facing upwards. Tuck the response card with the wording side up under the response envelope flap. Step 5: Place all the items in your stack inside your inner envelope. When your guest open the envelope the words should be facing them. Step 6: Place the inner envelope inside the outer envelope. When your guest open the outer envelope their names on the front of the inner envelope should be facing them.